EVG Research Team here. Last week we told you a story about a 13 year old who became a millionaire simply by solving a problem and “selling” his solution. The fact is, it really IS as simple as we discussed in that article. But the commenter is also right. Because we're talking about two different things. Let's call that step one in starting a business. The commenter was skeptical about this simplicity because he has a “great idea” that solves a huge, global hunger problem. The thing is, no one seems to care. And he hasn't found anyone who wants to “buy” his solution. And as frustrating as that is for him, it's an entirely different point. Well, that brings us to what we can call step 2. Because if people don't already want or need your solution, your business will likely fail. There are several different ways to find this information out before you sink too much time into a new business idea. Both work, but the hard way takes a lot more time and resources. In fact, there are entire companies built solely around doing this “market research” the “hard way” for their customers. And they charge a lot of money for it. The “hard way” is the way most giant corporations do it. They have endless resources and money to burn. And since market research is so vital to their success, they gladly pay the price. Individuals trying to start a profitable small business usually don't have endless resources. They want (and NEED) the easy way … the way that'll save countless hours of frustration and double or triple their chance of success when they finally open up for business. Fortunately, we've got the “easy way” solution for you, and I'll tell you how to get it in just a minute. First, we need to stress the importance of market research. It's an absolutely necessary step you must take before starting any business. At least if you want to make any money. Because without this step, your own small business could be doomed from the start. 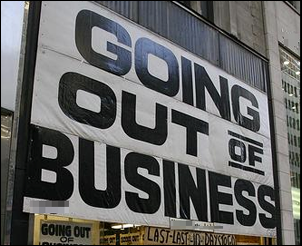 Last week I noticed a “Going Out of Business” banner on a shoe store near my home. Actually, I was surprised it was still in business. Because right when it opened, I talked to the owner (Norma Jean) about doing some marketing for her. The conversation was short. She didn't need any marketing or advertising, she said. Women buy shoes. Period. That was good enough for her. And her shoes were special. They were all very fashionable, but they all had built-in orthotics to produce perfect posture and ease back and leg pain. So she opened her little womens-only shoe shop in a storefront tucked between a grocer and an insurance agency. There were no other clothing stores anywhere nearby. Just a restaurant and a UPS store. She was actually excited about this location. She imagined she had the “shoe” market cornered. Her own little local monopoly. I asked if she'd done any market research. No. Didn't need it. I asked if she understood the law of proximity — that fact that it's actually good to have competitors nearby. Which is why you'll find so many shoe and clothing stores in a mall … or fast food joints clustered together on busy streets. Nope, she didn't need that either, she said. Norma knew women came to shop at the grocery store and figured they'd see her ladies' shoe store and just stop by. And she was partially right. People did stop by on their way to the supermarket. At least at first. But it turns out these women weren't interested in fashionable orthotics, because they were twice as expensive as regular shoes. Norma failed to find this out ahead of time. She had a great product and “solution.” But no market. I knew it intuitively, and predicted she'd be closed within a year. I was wrong. She stubbornly held on for 17 red-ink months before finally admitting defeat. I heard from a neighbor that Norma's also declaring personal bankruptcy. And that's sad, because a simple bit of market research would have saved her this current embarrassment. To have a profitable business, you need to solve a problem, yes. But you also need to have a “market.” Hungry customers who want — even demand — your product. In fact, here's a little tip: if you're thinking of starting a new business and don't have any ideas, one of the easiest ways to find a perfect business is to reverse steps 1 & 2 we outlined above. In other words, find those hungry customers first. THEN solve a problem for them. Of course, this is all still a birds-eye view. There's more to starting a business than just having a good idea and a hungry market. There's all kinds of little details too. But once you get all those little detail-ducks in order, it's not that hard to start your own profitable small business that brings in an extra $500 or $1000 per month. You can make even more if you want to work a little harder. And you don't need a storefront. Or an expensive market research company. Or even a “product” to sell. If that sounds interesting, Mike and Robert have a new course called Elevation Income to show how it all works. They take you step-by-step through the entire process of starting your own profitable business in 90 days or less, so you don't get overwhelmed by all the details. And they'll even show you that “easy way” to do market research I mentioned earlier. When you follow their simple formula, you can find a hungry crowd of paying customers in any niche in about 10 minutes. And that's the key to business success.